1- While in the form builder, click the "Publish" button on the toolbar. 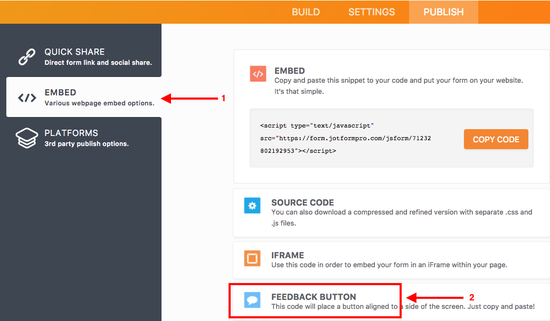 2- Click on "Embed", then select the "Feedback" option. 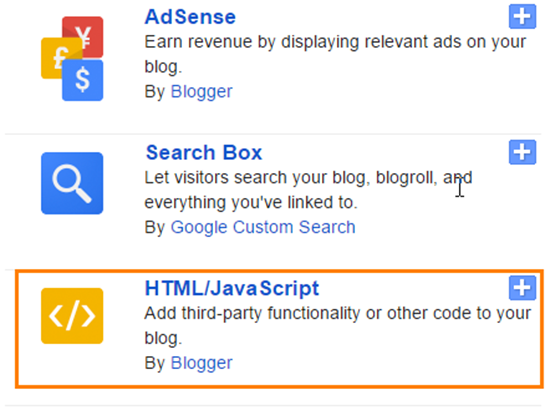 4- Open your Blogger Dashboard and click "Settings". 5- Click "Layout" from the top tabs and click "Add a Gadget". 7- Paste the code copied from JotForm. "Save" and it's completed. Great keep it up and also Update more.. Thanks a lot for this, very useful! 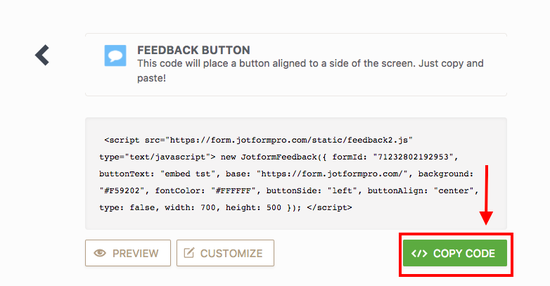 You should try BugRem.com if you want to have that feedback button easily installed. Helpful suggestions - I learned a lot from the information - Does anyone know if my company would be able to acquire a fillable IRS W-9 document to use ? I copied the code but the button doesn't show on my blog. I only see the title. thats great after 5 months i will buy a account of jotform . Como hago para k las imagenes k publique me salga pequeñas? после заполнения формы,переход на другую страницу. это понятно. но форма исчезает...Она потом для другого пользователя появляется ?? i do not receive the messages to my email address although i found them in your submission form why? Como faço para ver o que o pessoal escolheu? Hola, me ha encantado lo sencillo que es crear un formulario, con un diseño que elijamos e info que nos interese del contacto. I have added the the feedback form and it works fine, I wanted to know now that if somebody leaves a feedback, where can I view it. I am confused where is the "set up and embed tab"? ok so i realize that it does matter if it's the top gadget. it now shows up but the script isn't working. nothing happens when i click. and i know it's not a pop-up blocker issue because i've enabled pop-ups AND it works in the test. this doesn't work for me at all. does it matter that you add the gadget to the top or to the sidebar? Dear Seyhun now it's OK. Thanks Very Much! I love JotForm. I did my form and everything was OK 'till I got my test mail. I tried to input a video code at text field but I couldn't see that code in mail. can you share the same form across multiple sites ie Blogger and a Wix.com website? 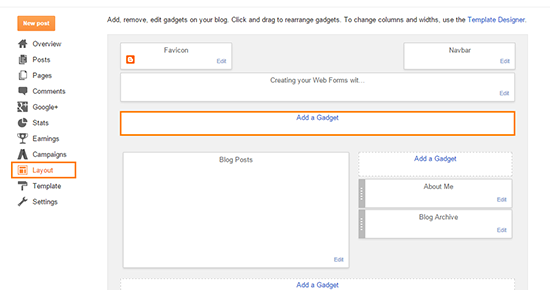 How to insert the form into a Blogger's template.